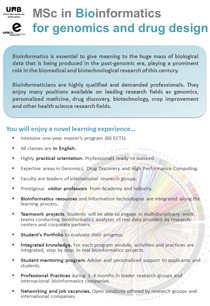 The MSc in Bioinformatics is a full time one year course, corresponding to 60 ECTS. The master program consists of seven modules (depicted in the diagram below). During the first semester, from October to February, students take all theoretical classes (both compulsory modules and one elective module) and on the second semester, from March to July, they perform their Professional Practices and their Master's Thesis (module 6 and 7). 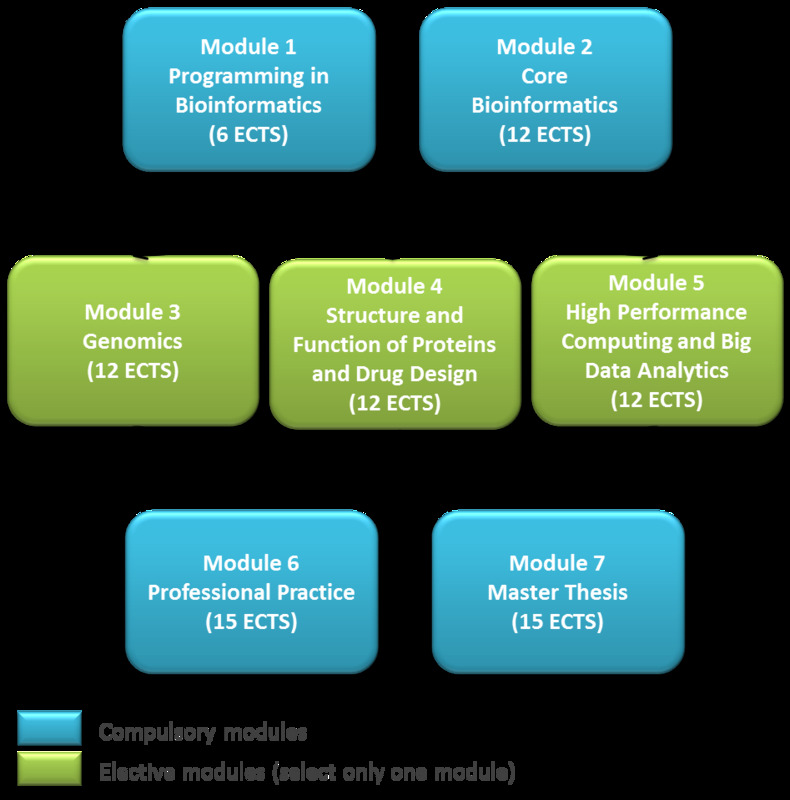 This modules applies the core tools and basic techniques for development of bioinformatics. This module displays the development of most common tools and bioinformatics resources used in Omics research. The aim is to provide our students the necessary background to enable them to apply bioinformatics in the multiples fields of the Bioinformatics research. The technological capacity to generate massive genomic data grows at a relentless pace without parallel growth of the bioinformatics expertise to deal with human, animal, microorganism and plant genomes. The purpose of this module is to provide the knowledge and technical skills which are required to successfully meet the current challenges of genomic analysis. The number of three-dimensional structures of proteins deposited in the Protein Data Bank (PDB) has grown exponentially in the last years because of the improvement in X-ray and NMR technologies. This module introduces the theoretical and practical knowledge of the computational techniques used to analyze, to characterize and to visualize protein structures and their interactions with other proteins, peptides or ligands. The immense outpouring of molecular data precipitated by Omics technologies require efficient statistical analysis methods combined with the use of modern computational power. This module aims to provide students with the necessary knowledge and skills (1) to implement performance engineering approaches into modern computing platforms and (2) to perform statistical analyses of Big Data. By following a problem-oriented approach, students will get insight about efficient computational algorithms, methods and platforms and the statistical methods to be applied to challenging bioinformatics problems dealing with Big Data. Performance engineering applied to common bioinformatics algorithms and tools (genome indexing, read alignment…). The Professional Practice (15 ECTS) is a compulsory module where students perform 365 hours of practice in research centers, companies or institutions, public or private. In this module, students have the opportunity to consolidate their training by integrating all the knowledge learned, applying and improving the professional skills and the abilities acquired throughout the course. The Master’s Thesis (MT) is an autonomous and individually research work that gives the student the opportunity to focus on some of the topics dealt with in the academic modules of the Master, as well as to integrate all together the capacities and competences achieved along the Master’s degree. The MT must show that the student has acquired the capacity to carry out sound and rigorous academic research. It should present an original argument that is carefully documented from primary and secondary sources. The student must do the work for oneself with the guide of an advisor. Enjoy the Power of Bioinformatics Thinking!